I started a new project yesterday as a quiet Sunday afternoon revelation came to me. I started this latest fun project as a resolution to a new problem I was experiencing with my new shorter hair style. I needed something to hold back my bangs while doing my morning face scrub, and found this very lovely headband pattern, just the ticket! Julia’s Cabled Headband is available for free. 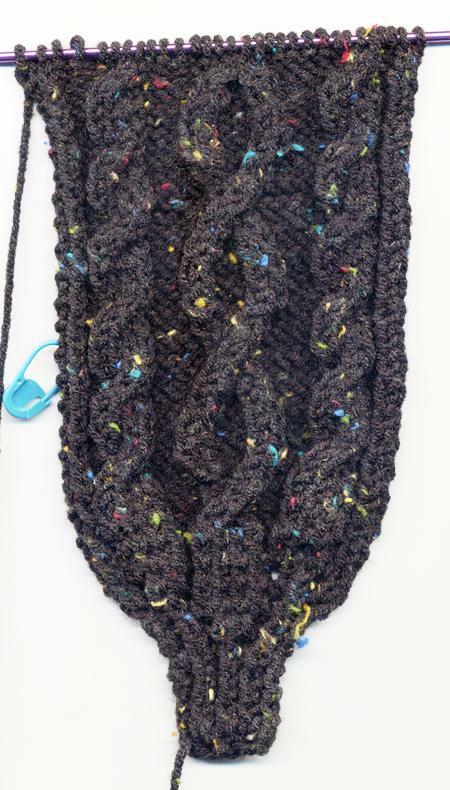 The cables are very easy, but definitely something to be done during Quiet Time…12 rows of pattern. I’m easily distracted by text messages from DD19, had to rip back 2 rows on one cross-over, purled when I should have knit, ooops! I hope to have this one done in a couple days. The Camo Vest is awaiting my return, I’m on row 39 for the Left Front, it’s mindless Garter stitch, and can be done in between orders throughout the day. Back to work! Happy knitting and enjoy the pattern!